I’m sure you have noticed that the online advertising landscape has changed. In the past, Google’s contextual advertising was touted to be The Way to advertise. But now, not quite so. Companies like Outbrain and Taboola have come out with a new ad format that combines image and text ad. The industry calls it Native Advertising. Here is a comparison between Contextual Advertising and Native Advertising. As you can see, a contextual ad is just text. 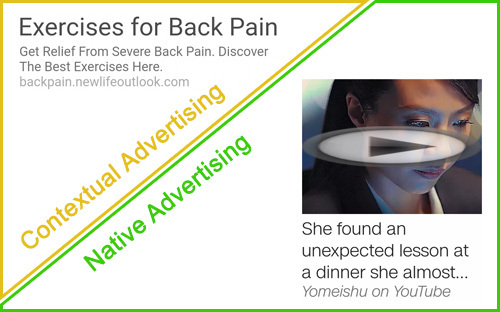 A Native ad includes image and text. It has the best of both worlds! The image will quickly capture readers’ attention while the ad text provides more info about what the ad is about and gives the final push to click. The good news is, LeadsLeap is moving into the Native Advertising format. If you login to your member’s area now, you will notice a few setup pages have been changed. From now on, Credit and Pro Ads must be set up with an image. Not just any image or your avatar, but an image that is relevant to your ad, and preferably one that can arouse people’s curiosity to click! It can be an earning screenshot, a proof of what you promote works, or perhaps a photo of yours showing how you work from home, provided it is relevant. Previously, we allow members to add several profile images and optionally use those images for their ads as well as profile photo. But since the image requirement for the new ad format is different, there is no longer a need to have so many profile images. If you go to your profile setup page now, you will see only 1 image left, which is your profile photo . Other images are not available any more. Well, the title says it all… Downline message image will be your profile photo automatically. Have you set a separate image for your downline message, it will be switched to your profile photo. Basically we have separated profile image from ad image. They are no longer interchangeable under the new system. Your profile image, the one that you set up in your profile page, will be shown in your Profile Summary, Downline Message and Social Review. Ads will have their own image. We have replaced the old image uploader with a new one. Yes, you can upload image from your mobile devices now, a feature several members have been asking. It supports copy and paste. You can upload a screenshot by simply copy and paste! Take a look at the animated demo below to see its copy and paste function. The copy and paste function will be handy when you set up an ad. You can simply take a screenshot and use it as the ad image. As soon as possible, please go to your Credit Ads and Pro Ads setup page, and add an image for your ad. You may also want to adjust your ad text to make it relevant to the image. Our reviewer has been instructed to reject ads with irrelevant image. Also, we’ve made some changes to the ad type. If you are advertising a blog, you may want to select the ‘blog’ ad type. For Pro Members, if you happen to see that an image has been added for your ad, that’s because we have added it for you. If it is not something that you like, just replace it. I would like to take this opportunity to apologize to those who have set up several profile images for the ads. I’m sorry that you have to do it again. But please, do not use the same profile image for your ads now. With a bigger ad image, your image can be more interesting and telling! That is an awesome news for all the members of LL. Our LeadsLeap portal is also changing with the fast changing world. Excellent makeover……Congrats LeadsLeap Team and all the best for future…….!!! This feature will increase advertising results. This is a great idea. It will be interesting to see how the whole layout will change to support these ads. Thanks for continuing to keep the site active and relevant in the industry. Great addition to the site thanks for always making things better here at Leads Leap. Looking forward to what comes next. Have a GREAT day. There’s nothing to say! Leads Leap is the best and will always be! I’m going to update my ads right now! gorgeous feature…. i love it! Great idea, but now just one more task to work on…I’ll try to get to it soon. This is truly Great News! Not only for my own brand, but for those of my affiliate programs as well. You’ve just pointed out an important point, ‘Brand’. It’s an excellent way to build your own brand since the ad with the image will be shown across all major Traffic Exchanges via our tracker. am pretty new. But this is great. tho i was good thing i knew my sponser. at the time I signed up. Thank you, Kenneth, for not resting on your laurels! sites, and how easy it will be for newbies to use the in-house ads and the compulsory images. face, even with things that seem so simple to the more seasoned marketers. You are right. It’s always hard to strike a balance between features and simplifications. Regarding the compulsory image, we have made is very easy by having the copy and paste feature. Anyone who uses it should have no problem adding a decent and interesting image. If you have any idea on how we can make things even easier, do let us know. To your surprise, we use the ‘unpractical’ way to add thumbnail to our social reviews. Automated screenshot has several limitations and may churn out undesired screenshots. Instead of having to decide and sort out useless screenshots, we decided to simply use a similar copy and paste method that allows us to simply use any screenshot we like as the thumbnail. We only have to do it once for each domain at the time when we approve the review, hence it’s not that time wasting. That’s an outstanding move forward. Thank you and I’ll be looking forward to seeing the complete update. So cool and so nice. A lot of split tests have shown native ads to get higher conversion rates. Great job!!! There are many Internet Markerters I’ve had the fortune of signing up on their Sites. LeadsLeap has definitely been one of them. Everything that Kenneth says he does, he does and there is no pressure to do anything. But even as a free member you get so much value and so many benefits It’s, I love this Site. And the new Format is awesome. Thank you Kenneth. I’m glad to be here with you and I can learn a lot from you and teach others. This is the same love as grace. Being a long time member here at LeadsLeap, the constant improvements are absolutely amazing, no other system provides so much for free. I’m very pleased to be associated with this wonderful and highly effective online program. These major industry leading improvements keep us here at LeadsLeap a step ahead of all of the other marketers online, which is the #1 reason that I’ve been a member here for so long. Thanks Kenneth for constantly working to help us become better marketers. Owo! Really, It’s a very important change in leadsleap. I have gone through many Internet Markerters but i would love to that LeadsLeap has definitely been on top one of all of them. Everything that Kenneth says he does, and here i saw there is no pressure for any one to do something. But even as a free member you get so much value and so many benefits It’s, I really love this Site. Once again thank you Kenneth.